Jiaozi, the Mandarin word for dumpling, is commonly served as a delicious side dish or a fun snack in Asia. Its Japanese cousin is the gyoza. What’s the difference between a jiaozi and gyoza? Turns out the two have a few key differences despite being quite similar. Originating in China, the dumpling, more commonly called the pot sticker, is made of wheat flour dough wrapper filled with meat and/or vegetables. This common side dish is cooked many different ways. Dumplings are most commonly steamed, pan fried, deep fried, or boiled. While jiaozi dates back about a thousand years, gyoza is a much more recent innovation. During World War II, the Japanese ate jiaozi while occupying Manchuria. After returning home, some Japanese sought to recreate the jiaozi back home using Japanese ingredients and preparation methods. The gyoza was soon born with a thinner dumpling wrapper and more finely chopped stuffing. The dish is most commonly pan fried to create a wonderful crispy texture that also enhances its unique flavors. 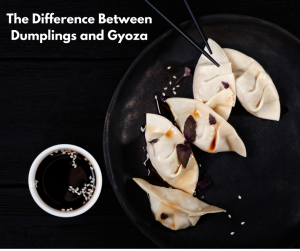 While the two are similar, dumplings and gyoza have distinctly different flavor, texture, and cooking techniques that set them apart. At Shogun Japanese Steakhouse, our gyoza features the unique flavors traditional to the Japanese dish. These tasty gyozas are the perfect appetizer for any meal. Treat yourself and your palate by reserving your table today at 407-352-1607.